2. ‘The expense of spirit in a waste of shame Is lust in action’. Whose lines are these? 4. Who wrote: “stone walls do not a prison make Nor iron bars a cage…”? 5. “The grave’s a fine and private place, but none, I think, do there embrace”. Whose lines are these? 6. “As civilization advances, poetry almost necessarily declines”. Who said this about epic poetry? 7. “The best lack all conviction, while the worst are full of passionate intensity”. Where are these lines to be found? Answer: in Yeats, ‘The second coming’. 8. In which century did Omar Khayyam write his Rubaiyat? 9. ‘Ask you what provocation I have had? The strong antipathy of good to bad’. Who said this? 10. “No Spring, nor summer beauty hath such grace, as I have seen in one autumnal face”. Who wrote these lines? 11. A poet Laureate made the modest claim, “I don’t think that since Shakespeare there has been such a master of the English language as I”. Who is he? 13. Who said, “Poetry makes nothing happen”? 14. Who wrote, ‘How beastly the bourgeois is especially the male of the species’? 16. “A politician is an arse upon which everyone has sat except a man”. A poet’s definition. Which poet? 17. “To keep your marriage brimming With love in the marriage cup, Whenever you’re wrong, admit it: Whenever you’re right, shut up”. Sound advice from a poet who studied women carefully. Who is he? 18. “Oh East is East, and West is West and never the twain shall meet”. In which poem of Rudyard Kipling does this line occur? Answer: ‘The Ballad of East and West’. 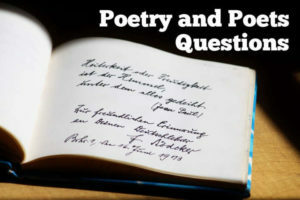 19. Who has been called the most venomous and malicious of the great English poets? 20. To which century do Heinrich Heine’s romantic lyrics belong?